Many people believe an unfortunate myth that they shouldn't eat before they go into their dentist's office for a cleaning or for a procedure. Others make the wrong food choices. Unfortunately, skipping a meal before you go into the dentist or eating the wrong foods could lead to some major problems. We all enjoy eating foods that are high in carbs, including pasta, cereal, and bread, but when it comes to your pre-dentist visit food choices, these aren't good options. You want to choose foods that will help to keep your energy level stable throughout your dental procedure, and highly-processed carbs just aren't able to do that. While they might provide an initial jolt of energy, once your blood sugar levels fall back to normal, your energy will also be zapped. Unfortunately, when your energy level decreases, your stress level will increase. Many patients are already stressed out just going to the dentist, so if your pre-dental meal doesn't sustain you throughout your appointment, this could leave you feeling restless, irritable, and even light-headed mid-appointment. A high-protein meal before you go to the dentist can help you to feel satiated for at least three hours. If you've got a long dental appointment coming up, a meal that is high in protein - such as eggs, nuts, or fish - can help you to continue feeling full throughout the procedure. Additionally, you'll still be feeling full right after your appointment, so you can take time to allow the anesthesia to wear off before you need to eat again. This can prevent you from chewing or biting your lip or inside of your mouth in the event that you try to eat while your mouth is still numb. 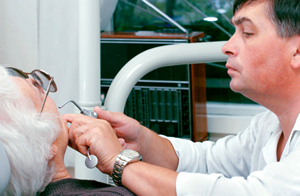 Do you have questions about how to prepare for your dental appointment? Contact our office today.